You might have heard that hamsters are very tidy. They like to keep everything on point and hate mixing things and places with each other. If you give them their personal quarters for living, resting, and dining, then they will keep the area separate and clean as much as they can. But still, there are some things that they can’t avoid. As they are living in a cage, it is impossible for them to get out. Therefore, their urine and dropping also rest inside the cage. In such scenarios, you should know how to clean the hamster cage properly. In the wild, hamsters usually poop and urinate away from their home. But when they are living in a cage, it is hard for them to get away. Thus, it is your duty that you will clean the cage from time to time to keep your hamster and the environment healthy. There are a few tips that would help you to carry out the regular cleaning without any difficulty. How Often Should You Clean The Cage? The first thing you need to do is a thorough inspection of the cage. Don’t just take a look, instead try to smell the cage and look for any pungent smell. If there is no smell, then the cage can go on without cleaning for a couple of days. But if you notice a stinking smell, then you should pay attention to the spot from where the smell is coming. When it is poop, you can just take out the soiled spot and replace it with fresh bedding materials. Look for food leftovers, droppings, or dirt. If you get irritated from the stink of the cage even when you are far away from the cage, then there is no doubt that the cage needs a complete cleaning. 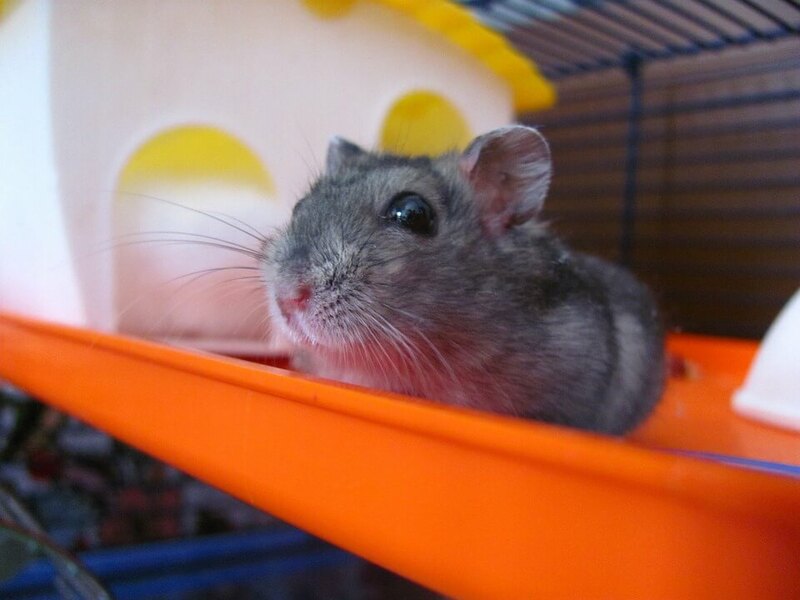 Remember that the hamster has a highly acute sense of smell and it can fall ill if the cage stinks. Once you ascertain that the cage needs complete cleanup, it is time that you gather up the materials needed for the cleaning. If the smell is very strong, then you will need a suitable face mask along with rubber gloves so that the smell won’t catch your skin. Take a washcloth, a suitable disinfectant that is also harmless for the pet, and the replacement bedding material too. Before you start cleaning up, you will have to make sure that your hamster is also in a safe place. It is apparent that you have to relocate your hamster for a little while as you clean up the hamster cage. Gently take your buddy out of the cage and put it inside a temporary shelter. Before and after you take the hamster in and out, wash your hands thoroughly. Now it is time for you to remove the extra accessories attached to the cage. Whether it is a toy, warmer, food bowl, plate, hideouts, exercise wheels, etc. Just take them all out as it will make the cleaning much more accessible. As you are about to remove the bedding, wear gloves and mask first. If the bedding has been substantially soiled, then you are most likely to need a face mask. If the bedding is alright, then you can leave out the mask but the gloves are must wear. Take out the bedding and instantly out it inside a waste bag and seal it to prevent the smell from getting out. Here comes the tedious part as you clean the hamster cage. Firstly you should clean the accessories like their exercise wheels, plates, bowls, etc. as they will take more time to dry as compared to the cage. Soak these things into a cleaning solution and disinfect them. Now as you clean the cage, keep dipping the washcloth in the cleaning solution. To clean the corners and small areas, you can use a cleaning brush. Once every corner is correctly rubbed with the solution, rinse it off with the water and dry the cage under the sun. The most important thing that you need to remember is that you should clean it properly. If you clean the cage rushing out everything, then you will forget some corners and cleaning will be in vain. Especially when you are cleaning the wire cages, you will need to clean every bar to make sure that the cage is appropriately disinfected. Along with the solution, UV rays of the sun will further disinfect the cage. When the cage is dry, assemble the cage back to its previous state. Put an ample layer of fresh bedding for the hamster and put the accessories back in their place. Remember not to put the hamster in the cage right away. It will take time to adjust with the clean cage. Let the hamster find its own way for the home. Typically, a hamster cage can go on without cleaning up to months. It is the food bowl, bedding, water bottle, etc. which needs regular cleaning. The food should be replaced every morning or evening as rotten food can affect hamster health. The same applies to the water. Frequent cleaning of the cage can cause them distress. Thus, it is vital that you don’t overdo things. The most critical area that needs cleaning is the place where your hamster poops and urinates. That area must be cleaned with disinfectant every day. The bedding can be replaced every week, but the cleaning schedule can change entirely if you have more than one hamster. They will need more attention and care to stay healthy and fit. Hopefully, now you know how you can keep the cage clean so that neither you nor your pet suffers from any kind ill effects from the dirty cage. 5 Reasons: When Hamsters Attack? How Long Do Hamsters Sleep?